United in faith: Hundreds of Australians joined the gathering including about 40 from Brisbane Neocatechumenal communities. 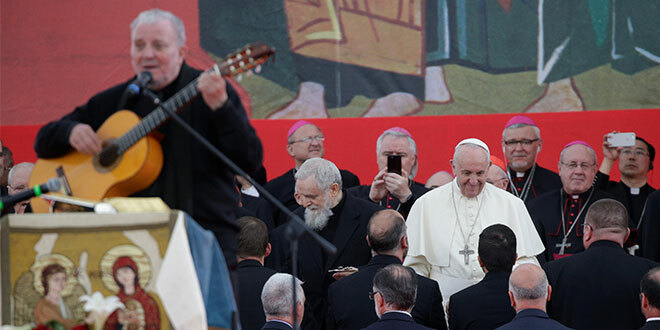 EVANGELISATION is a priority mission for the Church, Pope Francis told a mass gathering of members of the Neocatechumenal Way, including about 500 Australians, to mark the 50th anniversary of the group’s arrival in Rome. “Go. The mission demands that we leave,” Pope Francis urged the rally. On stage with cardinals and bishops from around the world, Pope Francis described the charism of the Neocatechumenal Way as “a great gift from God for the Church of our time”. 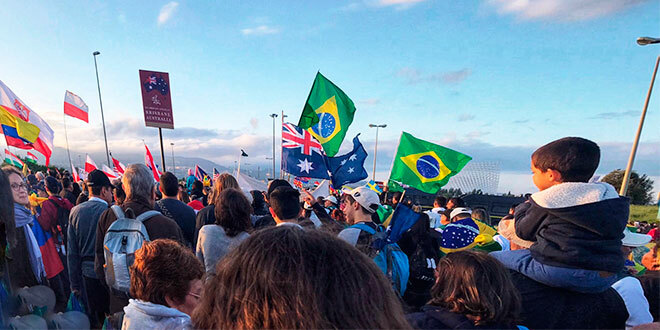 Faithful from 135 countries were present, including the hundreds of cheering Australians, waving national flags and applauding the Pope’s message. 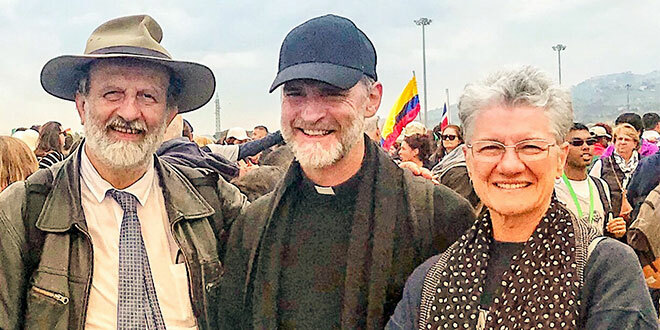 “The atmosphere at the meeting was wonderful – very relaxed and joyful,” Fr Anthony Trafford, one of the national “Responsibles” for the Neocatechumenal Way in Australia, said. The Neocatechumenal Way is a Catholic community founded in 1964 in Madrid by Spanish artist Kiko Argüello, dedicated to post and pre-baptismal formation of Christians, based on the Word of God, the Eucharist and the Christian community. The “Way” engages families who through their witness and life serve to establish the presence of the Church in countries where the Church is absent or tiny, or to revive and strengthen the presence of Catholic communities in difficult and highly secularised areas. About 40,000 parish-based communities have grown worldwide, and there are about 70 communities in 13 dioceses across Australia. Among the Australian contingent in Rome were scores of young Catholics and families from every capital. 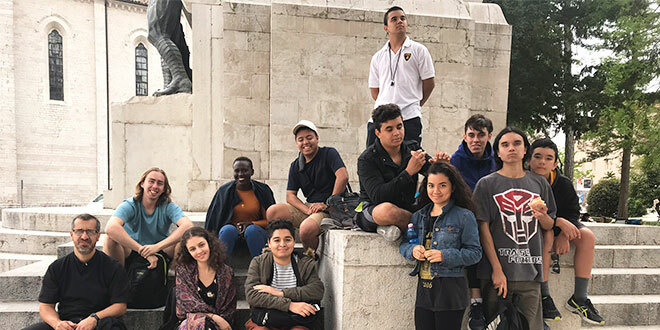 Pilgrims on the way: Brisbane youths, members of Neocatechumenal communities, on pilgrimage in Italy before meeting Pope Francis in Rome. Papal gathering: Neocatechumenal Way catechist for Australia, Toto Piccolo, Maroubra parish priest Fr John Hayes and Brisbane doctor Alison Bignell. During the encounter, Pope Francis blessed and handed out crosses to the leaders of 34 new “missio ad gentes”, which are groups made up of families and a priest sent to live in various parts of the world to evangelise the local community through what they call an “itinerant church”. He said when a missionary went out, he left with “only the baggage of trust” in the poor Jesus who did not have anywhere to lay His head. “To go, you must be light. To proclaim, it is necessary to renounce,” the Pope told the mass gathering, stressing that a heart freed of attachments broadens and becomes available to God and to others. One who renounced transitory things out of love, embraced the great treasure of freedom, he said. Pope Francis also pointed out the important role and vocation of the family, which had in its “DNA” the ability to bring a family atmosphere into “so many desolate and unconcerned places”. “Following the example of the Holy Family: in humility, simplicity, and praise … let yourselves be recognised as the friends of Jesus,” he said. Neocatechumenal communities across Australia also gathered to celebrate the Pope’s address streamed live on the internet. At Loganholme, south-east of Brisbane, a big-screen event hosted by parish priest Fr Rodrigo Tomala turned into a celebration for about 100 people in St Matthew’s Church hall. “For me, my experience is that the Neocatechumenal experience has floated my boat, and so I am happy to be celebrating – because this is the way God used to give me hope, to experience salvation,” Fr Tomala said. In the Loganholme crowd, Johanne Keys and her husband Richard joined the community in Melbourne’s St Luke’s parish of Lalor 40 years ago and have been a missionary family in Darwin and Brisbane. “If somebody had said to me that we would be going on mission, I would have said that it was definitely not in my plan and certainly wouldn’t happen,” Mrs Keys said. In living out the mission, Pope Francis also encouraged detachment from material things, which he said were only burdens keeping people from true freedom in Christ. The person who through love “learns to renounce the things that pass, embraces this great treasure: freedom”, he said. Pope Francis praised the relevance of Neocatechumenal Way. “Dear brothers and sisters, your charism is a great gift from God for the Church of our time. Let us thank the Lord for these fifty years,” he said. Evanglisers: Pope Francis greets people during a gathering of the Neocatechumenal Way at Tor Vergata, a field on the edge of Rome. Photo: CNS. Next: Is there a militant resurgence in Indonesia, the largest Muslim-majority nation?